Throughout its illustrious career, the celebrated Kilfenora Céilí Band from north County Clare has had various band members with the surnames Lynch and Ward, including P.J. Lynch, Tom Ward, and Jimmy Ward. 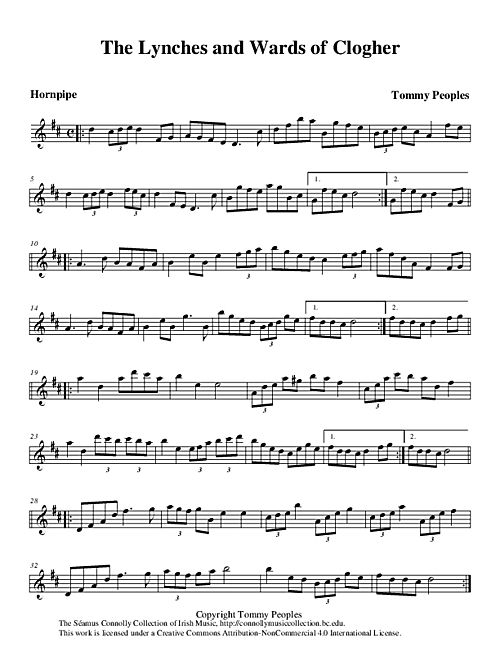 This composition by the extraordinary Tommy Peoples – who was himself a member of that great band – gives well-deserved honour to the Lynch and Ward families for their great contributions to Irish music. Peoples, Tommy (fiddle) (composer), “The Lynches and Wards of Clogher,” The Séamus Connolly Collection of Irish Music, accessed April 20, 2019, https://connollymusiccollection.bc.edu/document/422.